Very Good. 1573225789 ALL BOOKS SHIPPED WITHIN 1 DAY OF PURCHASE! This book is, indeed, a tribute to the author's mother. In it, the author, a man whose mother was white and his father black, tells two stories: that of his mother and his own. Tautly written in spare, clear prose, it is a wonderful story of a bi-racial family who succeeded and achieved the American dream, despite the societal obstacles placed in its way. 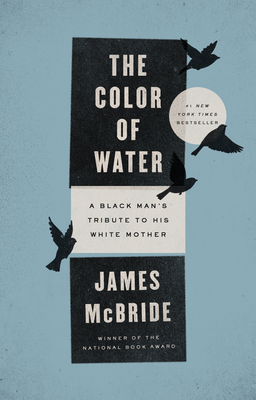 "God is the color of water"
In his book, The Color of Water, James McBride tells the story of his mother's life and the story of his own search for identity. It is the remarkably moving story of a young woman who is compelled to leave her home, her family, and her Orthodox Jewish faith and heritage behind her. Rachel Shilsky moves from Virginia to Harlem and marries Dennis McBride, a Christian black man. When her family learns what she has done, the entire family (collateral relatives included) declare Rachel dead and sit shiva. At that point, Rachel realizes that all ties to her past are severed. She becomes a Christian, changes her name to Ruth, and wholeheartedly throws herself into her new life without a backward glance. She founds the New Brown Christian Church in the Red Hook projects in Harlem, and raises twelve outstanding and highly accomplished children. Ruth's path in life is filled with crises, obstacles and painful situations. But Ruth's journey is one that is driven by love, compassion and determination. Fortunately, Ruth is equipped with a strong will and an amazing insight. When one son asks her the color of God's skin, her response is "God is the color of water". Like everyone else in this world, Ruth makes mistakes and has to deal with personality flaws. This woman does so with (and by) grace. James McBride shares his personal struggles as well. Throughout the majority of the book, young James grapples with racial identity issues, anger and anxiety. When James loses his stepfather in his early teens, his grief is so profound that he becomes unmoored for a few years. I am mixed race and was raised in a household of conflicting ideologies. I have to say that James McBride puts my feelings about my mixed upbringing into words -- and he gets it right. I alternately cried and laughed as I worked my way through the final five chapters of the book, its epilogue and afterword. I identified with virtually every sentence. All of us have something to learn from Ruth McBride and her family. This book has my highest recommendations. This book was so inspiring and full of perseverance. The end result of so much struggling is the most beautiful payoff I've ever seen.Three Thumbs Up!!!!!!!!!!!!!! !